This Bangkok Temple Guide is just a small selection of some of the most important as well as the most impressive temples you could ever wish to visit on your travels. There are close to a thousand temples scattered around this sprawling and chaotic city. Far too many to visit on any one occasion. And speaking of temples, did you know there are approximately thirty thousand temples throughout Thailand. On account of the limited or restricted time you may have to spend in Bangkok, I've compiled a detailed list of what is perhaps some of the best-known temples you may want to visit. Simply click on any one of the links to read and see each temple in much more detail. 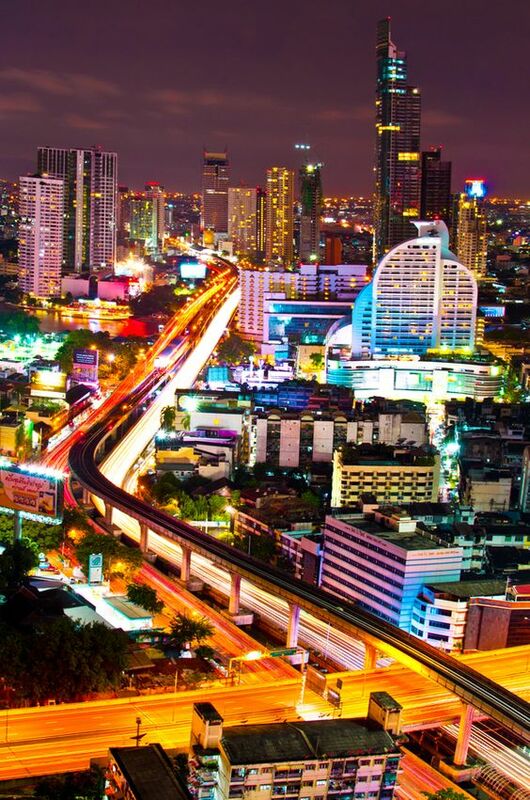 There are several exciting ways to explore Bangkok from a different angle and with that, emphasising on its local way of life, will possibly change your views of the city forever. For instance, using various transportation means, you'll never see the city in the same light when exploring ‘Krung Thep’ the way in which this 3-day Bangkok tour will show you as detailed in the link above. Should you choose to book your tour from this page (at no extra cost to you) you'd not only allow me to earn a small commission, but you'd also be helping me maintain this blog so that I can continue giving you more Thailand travel information. 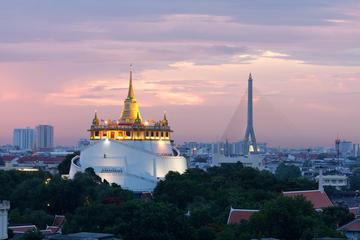 Most temples you'll come across in Bangkok are contained within what is referred as a Wat Complex. Allow me to explain. A Wat is basically a collection of buildings and structures within an enclosure that serve various purposes. Examples of this can be seen in monasteries, temples, chedi, wihans, bots, mondops and so forth. The structural style and layout of a Wat Complex may vary considerably, but follow the same basic principles as do the functions of the buildings. A Mondop is basically a square-shaped structure topped with either a cruciform roof as is easily recognised at Wat Benchamabophit or a spire as can be seen at Wat Phra Kaew. The edifice contains an object of worship or sacred texts. A Bot or Ubosot is an ordination hall mostly reserved for monks. It is similar in style to that of a wihan, but surrounded by bai semas whereas the wihan is not. A bot usually faces east and is often home to the "Wat's" most dominant Buddha. A Wihan, on the other hand, is an assembly hall similar to that of a bot only much larger. There are some exquisite examples of this type of an eclectic mix of architectural style buildings in Bangkok as well as throughout the whole of Thailand. A Chedi is a solid structure encasing a relic of a Buddha such as a fragment of bone, a sample of hair or ashes from a past king. Many of these structures are gilded in gold as seen on the Golden Mount. 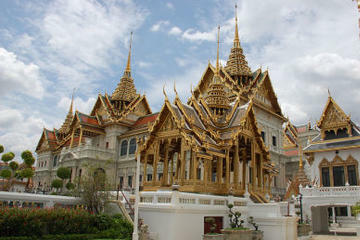 The Grand Palace is, without a doubt the most visited temple complex in Bangkok. Occupying an enormous enclosed area and containing Wat Phra Kaew within its grounds, the compound was for many, many years a self-sufficient city within a city. The palace was also the official residence of the king until 1946. Although some of the buildings may not be open to visitors, there is still a lot to see here. Wat Phra Kaew is mostly known as the temple of the Emerald Buddha, but this magnificent compound has so much more to offer. The monastic structures and palace chapels seen here were fashioned from the former capitals of Ayutthaya and Sukhothai. 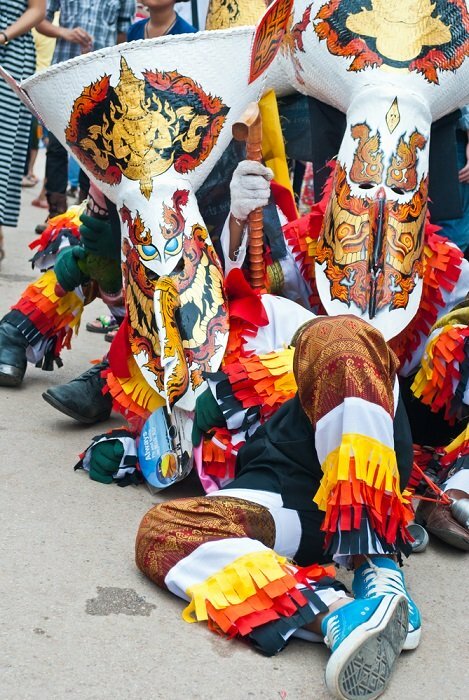 They symbolise the simultaneous founding of the Chakri Dynasty. This temple complex is probably the most popular tourist attraction in Bangkok. So if you're keen to walk in my footsteps, the half-day sightseeing tour in Bangkok as viewed in the details above, could be the very one for you. This tour can be taken either in the morning or afternoon depending on schedule. This will allow you the opportunity to explore the whole complex accompanied by a local guide. Wat Arun is a striking Bangkok landmark also known as the Temple of Dawn and named after Aruna, the Hindu god of dawn. This particular Khmer architectural inspired temple owes its name to a legend in which King Taksin who after arriving here at sunrise from the sacked capital of Ayutthaya, soon began to enlarge the small temple that once stood on this very site. The temple's impressively tall prang stands majestically proud on the banks of the Chao Phraya River. Wat Benchamabophit is the last major temple to be built in Bangkok and it has a unique blend of classical Thai and nineteenth century European architectural design. It's also known as the Marble Temple due to its Italian marble wall cladding. The building sports exquisite cascading cruciform roof levels and stained-glass windows depicting scenes from Thai Mythology. It's also home to a reproduction of a highly revered Buddha and well worth visiting. Wat Bowonniwet is a nineteenth-century temple located in tree-filled grounds. The temple has a strong Chinese style architectural influence and is the centre for the strict Thammayut sect of Buddhism. The grounds contain a central golden Chedi flanked by two symmetrical temples. They house several murals depicting traditional two-dimensional Thai scenes, but from a more western perspective. Wat Rachanadda Buddhist Temple in Bangkok is also home to the multi-tiered Loha Prasat Monastery or metal castle as it is known. Apart from it being the main attraction, it's inescapably the most striking feature here. The monastery is 36 metres high with 37 metal spires signifying 37 virtues toward enlightenment. Wat Saket is situated between Boriphat Road and Lan Luang Road just outside the new city walls. 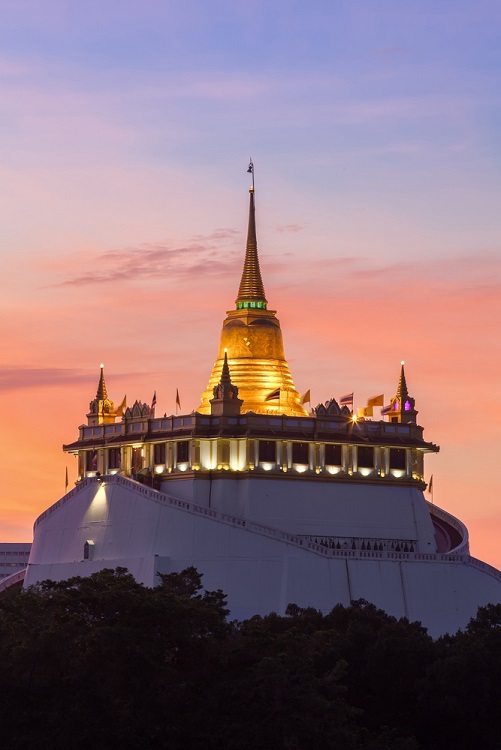 The temple is known as the Golden Mount and a well-known landmark in Bangkok containing Buddha relics within the temple's 58 metres high Chedi. From here you'll be able to enjoy the most spectacular views of the city. Wat Suthat is Thailand's sixth most important temple populated by pagodas and statues. On its grounds in Bangkok stands the tallest viharm home to one of the largest surviving Sukhothai Bronze Buddhas. On the square in front of the temple is a red-painted Chinese frame known as Sao Ching Cha. This giant swing was once the centrepiece for an annual ceremony honouring the Hindu God Shiva. Wat Pho is not only the largest and oldest temple complex in Bangkok, but it's also Thailand's foremost public education centre. The chapel housing the enormous gold-plated reclining Buddha has turned the complex into a place of learning. On the premises is one of the most respected massage schools and the courtyards are a labyrinth of walkways with several Chedi's, including the central Phra Si Sanphet Chedi where the remains of a sacred Buddha image is encased. Wat Traimit is mostly acknowledged as the temple of the Golden Buddha as it's here that the world's largest solid gold Buddha resides. It's made of 18-carat gold and weighs more than five tonnes. Believed to be a 13th-century Sukhothai image, its real golden identity was only recently discovered by pure accident in 1955.